Enter your email address below to receive a notification when ComicCrate starts accepting new sign-ups! Enter your email address below to receive a notification when ComicCrate is accepting new sign-ups again. 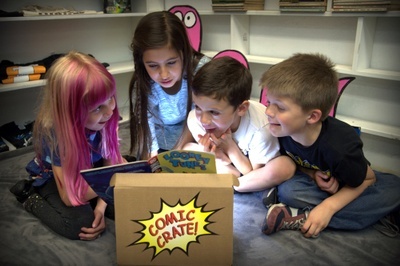 We ship Comic Crates every week, so you won’t have to wait long for your order. 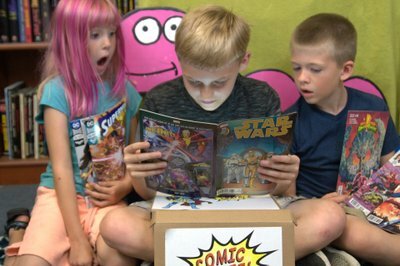 Surprise and delight the Comic Book Lover, Reluctant Reader, or English Language Learner in your life with a carefully curated selection of comic books! 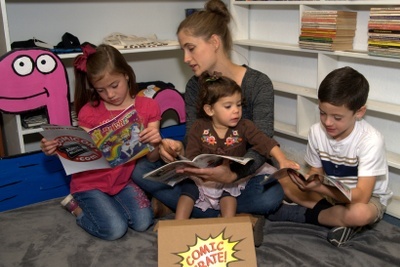 The comics in your Comic Crate are personally selected by parents who are also comic book lovers, and feature great stories, quality artwork, adventure, and suspense. Each month, you'll receive 6 brand-new comics that we've personally selected to match the rating you request. Sometimes we'll swap in a vintage collectible comic for a surprise! 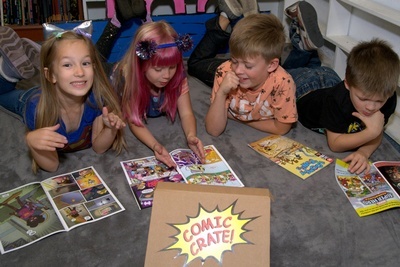 A G-Rated Comic Crate is great for younger readers, and features simple artwork and language. Examples of G-Rated comics include My Little Pony, Sonic the Hedgehog, Star Wars Adventures, and Disney. 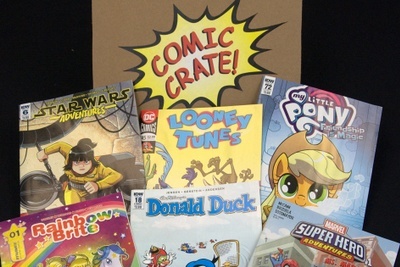 A PG+ Comic Crate has comics with detailed artwork, intermediate language, and superhero violence. Examples of PG+ Rated comics include Batman, Aquaman, Power Rangers, and Fantastic Four. A Teen+ Comic Crate has comics with detailed artwork, advanced language, violence, and occasional profanity/suggestive themes. Examples of Teen+ Rated comics include Avengers, X-men, Justice League, Wolverine, and Wonder Woman. 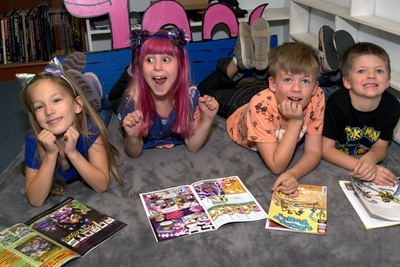 Comic books are a great reading experience for all types of readers. 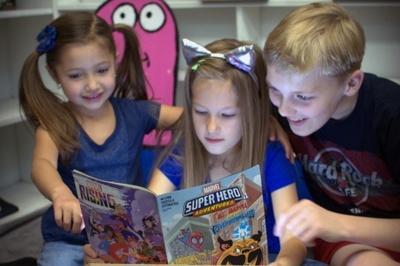 Reluctant Readers enjoy comic books because the short bursts of text and vivid images are easier to read than the solid text in a prose book. 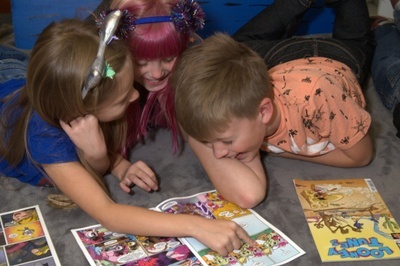 English Language Learners can match the text to the images in comic books to help decode and understand the text. 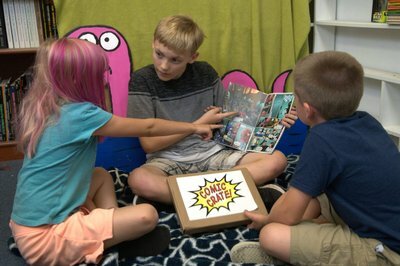 Proficient Readers can enjoy the art and text, while learning how the comic medium models concise language. 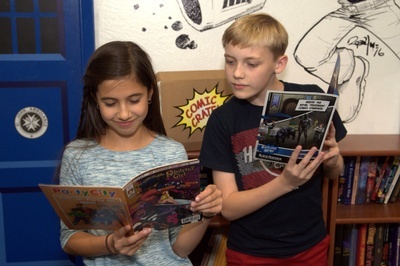 Comic Book Lovers of all ages and reading levels can appreciate and enjoy the enticing and engaging stories in today's comic books. My son loves getting mail and I was trying to find ways to make him enjoy reading- ComicCrate is perfect. In the first box (well every box) there is a postcard so kids can give their feedback too- also a great/fun educational tool. My son explained what he liked and didn't like- he didn't like Power Rangers- and ComicCrate responded AND they also made sure the next box was updated to match his interests. So worth the money to see his excitement each month when ComicCrate arrives in the mail. Great for adventurous young readers!